Several officers have been shot in Baton Rouge Sunday morning while on duty less than a mile from police headquarters, police said. Police in Louisiana use robot to check for explosives near body of suspect after 3 officers were killed, 3 wounded in Baton Rouge shooting. JUST IN: White House official: Pres. 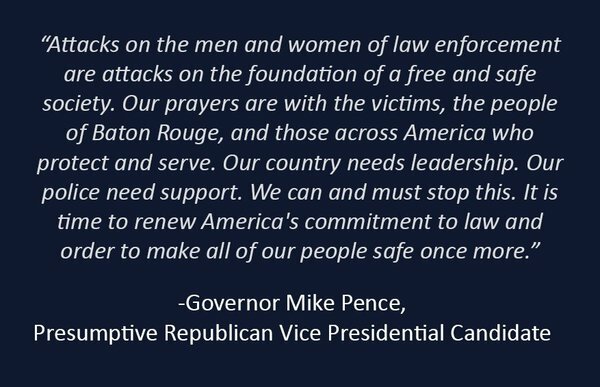 Obama has been briefed on shooting of police officers in Baton Rouge. Mom says son was coming to hospital because sick but he carries a gun. Says it is legal. Says officers told her they'll release him. He's been released. Drove away in his own car. A spokesman for the Louisiana state police says they believe the gunman who killed three officers in Baton Rouge was the only shooter but that officials are unsure whether he had accomplices. Major Doug Cain said Sunday, "we are not ready to say he acted alone." Cain says two people had been detained in another town called Addis, which is near Baton Rouge, and called them "persons of interests."